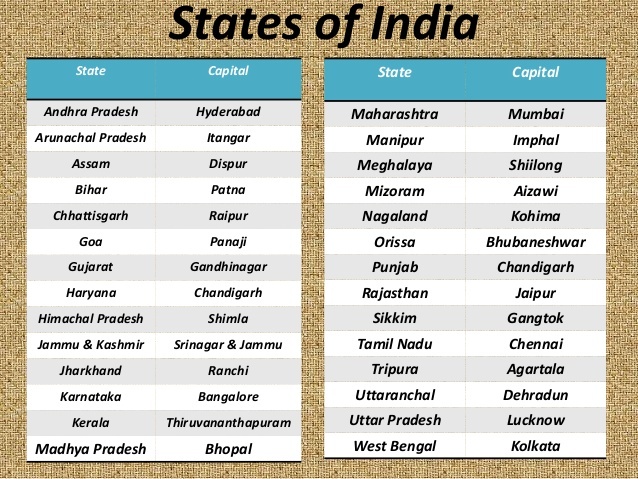 State and Union Territory of India, languages, Capitals, and the population – with detailed maps and India now have` 29 States and 7 Union Territories. And information on the list of Indian states and union territories in Bihar – Patna 2. West Bengal – Kolkata 3. Assam – Dispur 4. Andhra Pradesh – Hyderabad | Amravati and Territory administrative capital executive government offices, the legislative capital of the state legislature (state assembly) and the judicial capital of the Indian state or regional court (High Courts of India) is near. and Indian states with their capital and official languages for RAS, IAS, UPSC, RPSC, 1st, 2nd, 3rd Grade Teacher, REET CTET, LDC, SSC CGL, IBPS, MBA, CAT, MAT, SBI-PO, RBI, IIFT,IIT,ITI, And Railway, Indian Army And all competitive Exams.